Uglyworld #1889 - Olds Time Hockey! - (Project Cinko Time - Image 95-365), a photo by www.bazpics.com on Flickr. 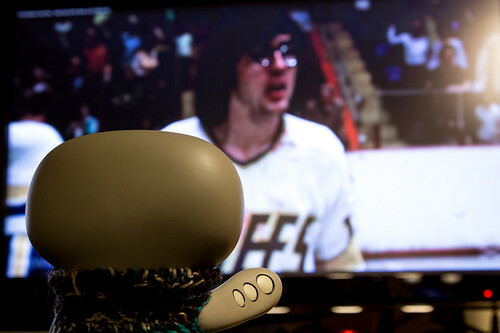 To helps get me and Mireille in the moods for Baz's ice hockeys tournamentaller this weekend we decidereds to watchers what Baz callers "The bestesters ice hockey filmer of alls timer!". Me and Mireille wasn't too sures, until this trio of complete mentallers callereds the Hansons showereds up, they is one hundreds percenters fruity loopers! Ha ha ha, this weekender is going to be awesomers! p.s. Don't worries, I will tells you all abouts it on Sundays!